Judo, meaning “gentle way” is a modern martial art, combat and Olympic sport created in Japan in 1882 by Jigoro Kano (嘉納治五郎). Its most prominent feature is its competitive element, where the objective is to either throw or takedown an opponent to the ground, immobilize or otherwise subdue an opponent with a pin, or force an opponent to submit with a joint lock or a choke. Strikes and thrusts by hands and feet as well as weapons defenses are a part of judo, but only in pre-arranged forms (kata, 型) and are not allowed in judo competition or free practice (randori, 乱取り). A judo practitioner is called a judoka. The philosophy and subsequent pedagogy developed for judo became the model for other modern Japanese martial arts that developed from koryū (古流, traditional schools). The worldwide spread of judo has led to the development of a number of offshoots such as Sambo and Brazilian jiujitsu. 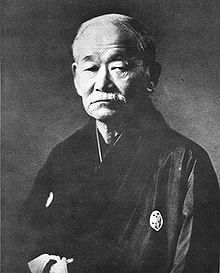 The early history of judo is inseparable from its founder, Japanese polymath and educator Jigoro Kano (嘉納 治五郎 Kanō Jigorō, 1860–1938), born Shinnosuke Kano (嘉納 新之助 Kanō Shinnosuke). Kano was born into a relatively affluent family. His father, Jirosaku, was the second son of the head priest of the Shinto Hiyoshi shrine in Shiga Prefecture. He married Sadako Kano, daughter of the owner of Kiku-Masamune sake brewing company and was adopted by the family, changing his name to Kano, and ultimately became an official in the Bakufu government. Jigoro Kano had an academic upbringing and, from the age of seven, he studied English, Japanese calligraphy (書道 shodō) and the Four Confucian Texts (四書 Shisho) under a number of tutors. When he was fourteen, Kano began boarding at an English-medium school, Ikuei-Gijuku in Shiba, Tokyo. The culture of bullying endemic at this school was the catalyst that caused Kano to seek out a Jujutsu (柔術 Jūjutsu) dojo training place at which to train. Early attempts to find a jujutsu teacher who was willing to take him on met with little success. With the fall of the Tokugawa shogunate in the Meiji Restoration of 1868, jujutsu had become unfashionable in an increasingly westernised Japan. Many of those who had once taught the art had been forced out of teaching or become so disillusioned with it that they had simply given up. Nakai Umenari, an acquaintance of Kanō’s father and a former soldier, agreed to show him kata, but not to teach him. The caretaker of his father’s second house, Katagiri Ryuji, also knew jujutsu, but would not teach it as he believed it was no longer of practical use. Another frequent visitor to Kanō’s father’s house, Imai Genshiro of Kyūshin-ryū (扱心流) school of jujutsu, also refused. Several years passed before he finally found a willing teacher. In 1877, as a student at the Tokyo-Kaisei school (soon to become part of the newly founded Tokyo Imperial University), Kano learned that many jujutsu teachers had been forced to pursue alternative careers, frequently opening Seikotsu-in (整骨院, traditional osteopathy practices). After inquiring at a number of these, Kano was referred to Fukuda Hachinosuke (c.1828–1880), a teacher of the Tenjin Shin’yō-ryū (天神真楊流) of jujutsu, who had a small nine mat dojo where he taught five students. Fukuda is said to have emphasized technique over formal exercise, sowing the seeds of Kano’s emphasis on randori (乱取り randori, free practice) in judo. On Fukuda’s death in 1880, Kano, who had become his keenest and most able student in both randori and kata (形 kata, pre-arranged forms), was given the densho (伝書, scrolls) of the Fukuda dojo. Kano chose to continue his studies at another Tenjin Shin’yō-ryū school, that of Iso Masatomo (c.1820–1881). Iso placed more emphasis on the practice of kata, and entrusted randori instruction to assistants, increasingly to Kano. Iso died in June 1881 and Kano went on to study at the dojo of Iikubo Tsunetoshi (1835–1889) of Kitō-ryū (起倒流). Like Fukuda, Iikubo placed much emphasis on randori, with Kitō-ryū having a greater focus on nage-waza (投げ技, throwing techniques). Judo practitioners use tatami vinyl mats and also EVA jigsaw mats for training. The kind supplied by Ezymats.